At A Garden Suite B&B in Pietermaritzburg, were were delighted to host folk participating in the Cycling Champs and even more delighted to hear that one of our guests came second in the elite section and he was only 17!!! We would love to claim that it was our delicious breakfast that helped his performance but he is actually just extremely talented. Winter is definitely on it’s way with chilly mornings and evenings but at midday we are peeling off all the layers. For the chilly winter mornings we have added porridge and hot milk to the menu and although we serve a continental health breakfast there is always something warm and savoury to follow and ofcourse a steamy coffee plunger gets everyone “op en wakker”.On the weekends my husband, Andrew, spoils everyone with cream crumpets. Have a look at our new French Room – while it is not a big room like our Main Garden Suite, it is lovely and cosy and we hope to add a deck on soon for sundowners! Our rooms are kept toast with heaters, blankets and throws. 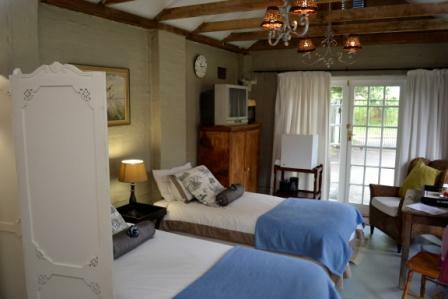 Have a look at our website on http://agardensuite.co.za and make a booking enquiry.